Four years ago at the Geneva International Autoshow, Bentley wowed the crowd with a new concept car that demonstrated the brand’s design language for the not so distant future. The car also featured Bentley’s acceptance of new technologies, like a V6 plug-in hybrid powertrain and 3D printed parts like the iconic mesh front grille. With only two seats, the Speed 6 is slightly smaller that the Continental GT and would be poised to take on the Porsche 911 and Jaguar F-Type. There are reports that this Baby Bentley was green-lit for production, but we’ve yet to see a final road-going version. Thankfully, resin model manufacturer GT Spirit gave us this 1/18 scale version as a treat for our eyes. As with all resin models, there are no opening parts, but the trade off is exquisite details, perfect panel gaps, and a high-end paint job. 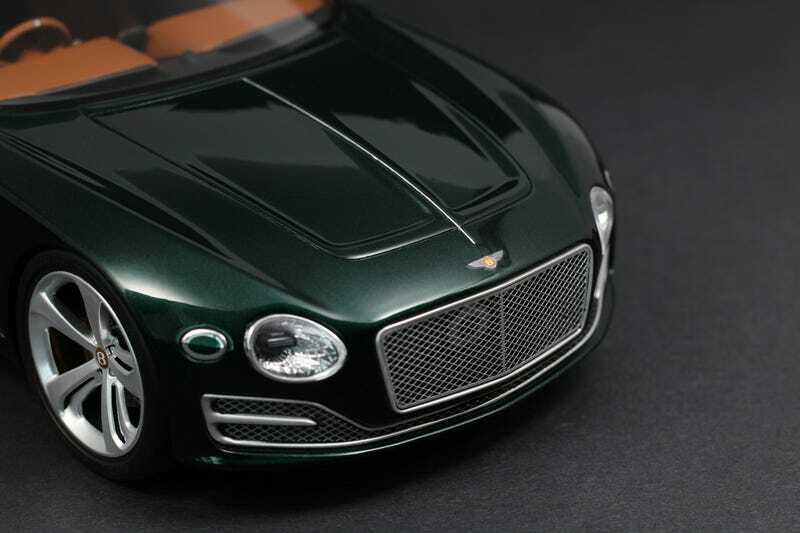 Loads of metal flake make the British Racing Green body of this car shine from across the room. The jewel-like headlights really stand out on this model. GT Spirit even included the “Bentley” inscription on the lamp. Real mesh was used to recreate the front grilles, and even though mine has a small nick in the front, I was able to edit it out of my photos. The wheels on this model are unfortunately static, but the inability to roll is made up with exceptional brake rotor and caliper details. Fitted luggage, a dashboard clock, and an exquisite interior adorned with chrome and leather-like appearances are among the details behind the model’s windows. Overall, I’m really impressed with GT Spirit’s recreation. This isn’t a model I would usually put into my collection, although it does fit in with my other concept cars. I grabbed this one off eBay while they were running a coupon code, and it was the very definition of an impulse buy. Looking forward to adding some more GT Spirit models to my collection this year!